Save up to £600 on new hi-fi and AV kit with Sevenoaks’ Technology Trade In | What Hi-Fi? Words that will be familiar to you if you’ve ever experienced ‘upgrade guilt’ – the feeling that you probably shouldn’t get the new AV kit you need because the thing you have is still just about functioning and you can’t justify the cost. Sevenoaks Sound and Vision’s Technology Trade In is for you. If you have a qualifying CD player, amplifier, speakers, AV receiver or wireless speaker that you want to upgrade, you can part-exchange it for the latest equipment from NAD, Bluesound or PSB, offsetting a hearty chunk of the cost. For example, you could trade in your dusty old wireless speaker for a sleek new hi-res audio-ready, MQA-compatible Pulse Mini from Bluesound, saving £100 in the process. Or you could trade your wheezing amplifier for £150 off a crisp, new, hi-res DAC-equipped NAD C 368. 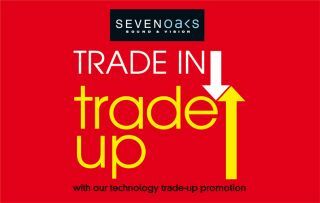 To find out more about Sevenoaks’ Technology Trade In promotion, click here. The offer only works in store, so click here to find your nearest branch of Sevenoaks Sound and Vision.